This 1958 cartoon appeared in a magazine for college students studying agriculture at Kansas State. It depicts the farmer of the year 2000 tending ever so leisurely to his hyper-futuristic push-button farm. While it's clearly tongue-in-cheek, none of the technologies depicted are that far off from very sincere predictions of that time. 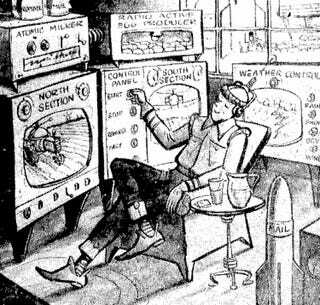 Weather control, radioactive crops and lounge chair farming were all promises made to farmers of that distant year 2000. Push button agriculture in the year 2,000 A.D. This is how the Kansas State College Ag Student, magazine for K-State students in agriculture, illustrated an article on the subject in the December issue, Gary Yeakley, writing half in fun and half seriously, foresees underground feed lots, copto-spraying use of selective hormones, and remote controlled jets and atomic-powered tractors. From the January 1, 1958 Hutchinson News (Hutchinson, KS).